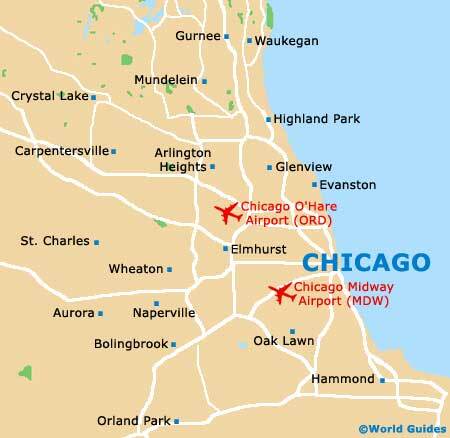 Two major airports serve northeastern Illinois - Chicago Midway (MDW) and O'Hare Airport (ORD). The Chicago O'Hare International Airport is to be found to the northwest of the downtown district, next to the Elk Grove Village area and close to the Catherine Chevalier Woods, where it is partly based in both Cook County and DuPage County. This air facility ranks amongst America's largest and is currently the world's third-busiest, boasting more than 70 million passengers each year, along with around 900,000 annual flights. O'Hare International Airport resides in the region of 29 km / 18 miles away. The principal airlines operating here include American Airlines, American Eagle, AmericanConnection (operated by Chautauqua), Delta Connection (operated by Chautauqua, Comair, Compass, ExpressJet, Pinnacle, Shuttle America and Skywest), JetBlue Airways, Scandinavian Airlines, Turkish Airlines, United Airlines, United Express (operated by Chautauqua, Colgan, ExpressJet, GoJet, Mesa, Shuttle America, SkyWest and Trans States), US Airways and Virgin America. Chicago O'Hare ORD Airports Guide. Chicago's O'Hare Airport comes with four separate passenger terminals, comprising nine concourses and just over 180 individual aircraft gates. 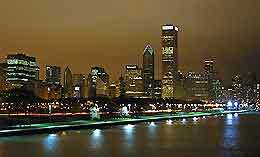 Downtown Chicago is easy to reach by several major highways close to O'Hare Airport. When traveling to the city center, head towards the Interstate I-90 East (Kennedy Expressway), before joining the I-94 East, West Adams Street and then the Jackson Boulevard. This trip can take as little as 30 minutes, although it should be noted that during the morning and evening rush hours, you should allow a good 45 minutes. An alternative route is via the I-294 (Tri-State Highway) to the south, and then east along I-290 (Dwight D. Eisenhower Expressway). Continental Airport Express shuttle buses depart for all destinations from outside of O'Hare Airport's terminals and travel into the city. The buses depart at regular intervals, while convenient shuttles can be found at the Bus Shuttle Center, on the lower level of the car park in Terminal 5 (reached via pedestrian tunnels). Private hotel shuttle buses can also often be arranged. O'Hare Airport has a train station residing on the lower level of the main parking area, in a basement-type setting. Operated by the Chicago Transit Authority (CTA), these Blue Line trains run throughout the day and night, roughly four times an hour. There are also Metra North Central commuter trains available and these connect various suburbs. Worth noting, three-day and seven-day CTA Transit Cards may prove good-value. Taxis are available at O'Hare from the queues located outside of the arrivals area of each terminal building. The journey from the airport into downtown Chicago lasts between 30 and 45 minutes, depending upon traffic conditions, while further popular taxi destinations include Avondale, the Chatham-South Shore, Chinatown, Humboldt Park, Irving Park, Lincoln Square, the Little Village area, Logan Square, Midway, Mount Greenwood and Pilsen, as well as the neighborhood of Uptown. Luxury limos provide a more upmarket alternative.